Here are some more of my circus freaks/performers collection. We’re going to start our tour of the circus in the sideshow, where P.T. Barnum was a busy man – he collected strange people from all over the world, and when he couldn’t find them from afar, he invented foreign origins for them! Waino and Plutano(r), the Wild Men of Borneo, were actually brothers born in Ohio with physical and mental developmental challenges. As you can see in the photo, even in adulthood, they were pygmy sized. They did however possess considerable strength for their size, and were known to lift up to 300 pounds. Their real names were Hiram and Barney Davis (no relation!). They were a huge success in Barnum’s circus and over a 25 year career in show business spanning from 1880 to 1905, they earned $200,000, a gigantic sum in that day and age. As you can see, this was yet another carte by Chas. Eisenmann, who specialized in photographing theater people and performers. 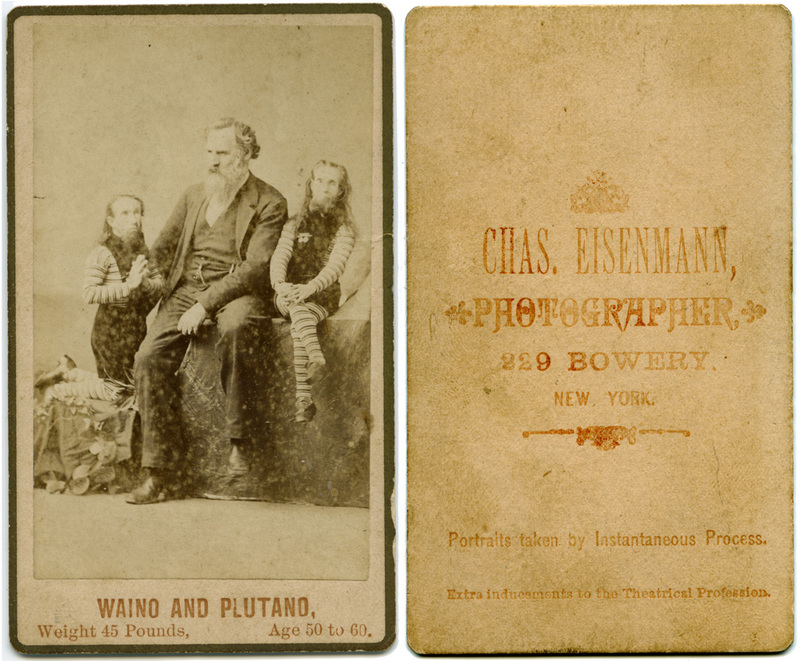 I love the Victorian era advertising slogans – “Portraits taken by Instantaneous Process – Extra Inducements to the Theatrical Profession” on this carte, and on another one I have by him, it shows a photographer striding the globe, with “The Popular Photographer” inscribed below. It’s too bad the carte-de-visite tradition died out; there’s nothing quite like it today in terms of marketing and character. Next up, also in the sideshow, is the fat lady. Why this particular display was so popular, I’ll never quite understand. I don’t think the fat ladies sang or had any particular performing talent – they were just fat. I think it would have to have been one of the most humiliating experiences in the sideshow, to be looked at that way. At least in the other circus freak cases like the human skeleton or the midgets, they had little or no other viable employment options. This image is an E&H.T. Anthony publication, with no credit given as to the photographer. The image has the Anthony blind stamps in the corners, and what appears in the scan to even be a fingerprint, possibly of the person who printed and mounted it. It is a breathtakingly beautiful carte in person, and I would suspect that it is probably a Brady carte, given that Anthony owned the Brady negatives for many years, and served as Brady’s publisher/distributor. 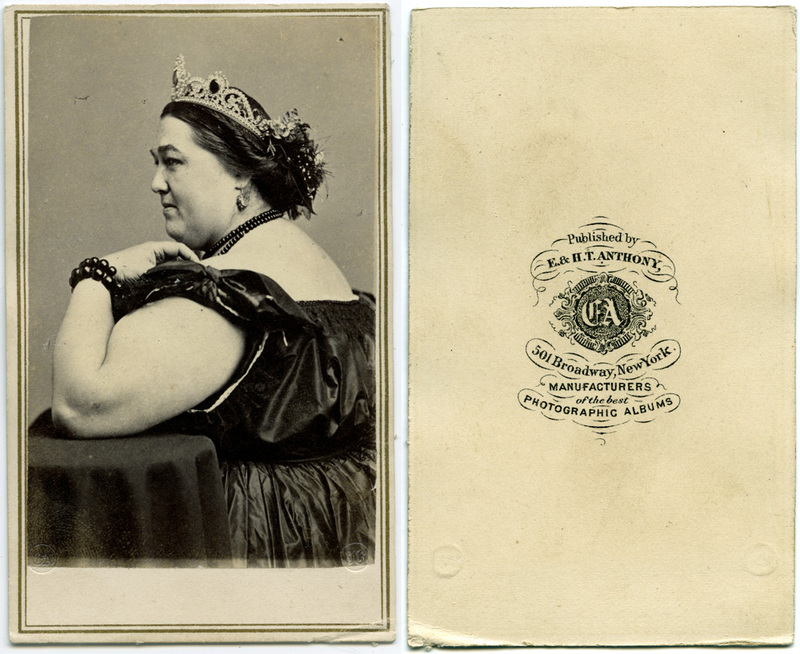 The lady appears to be Madame Sherwood, a famous fat lady in Barnum’s circus. 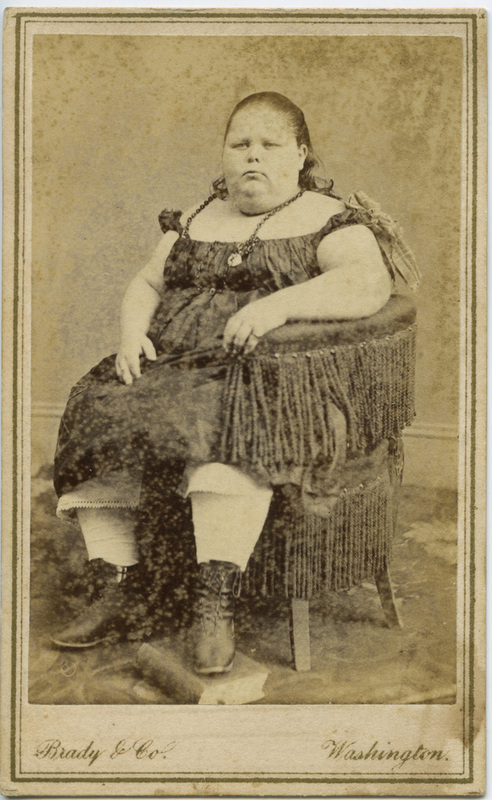 She also bears a vague resemblance to another fat lady I have, this one from the Brady studio in Washington DC. I don’t think the Brady image is the same woman, but it’s possible. Moving under the big top, we have the acrobats! Here is a trio of boy tumblers/high-wire walkers/trapeeze artists. 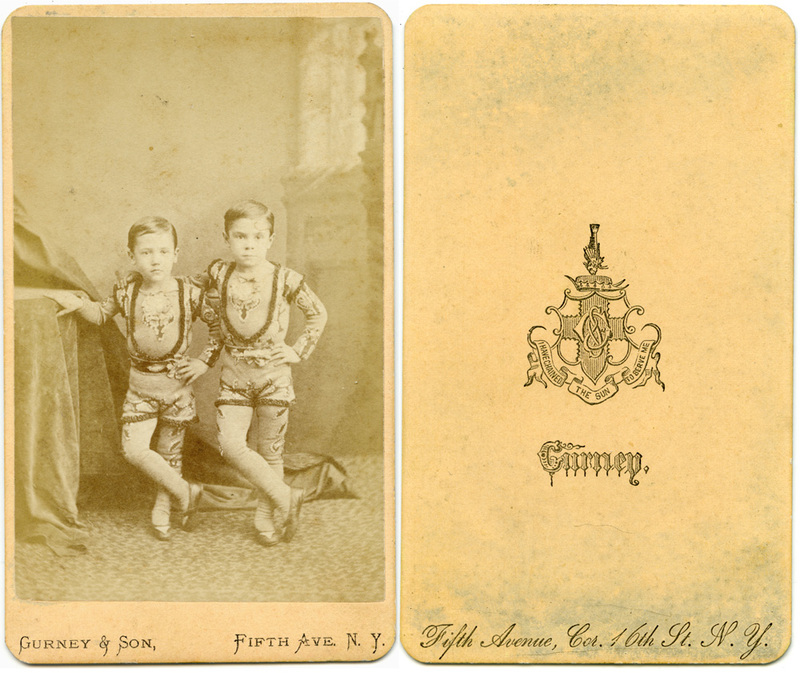 They look very much like the two I have in another cdv, which I’ll post again here for ease of comparison. If they are the same brothers, then the third one’s name is a mystery to me – the first pair appears to be the O’Brien brothers, but in my research, they were only ever a duo, and their father died fairly young as a result of injuries sustained in a circus accident. 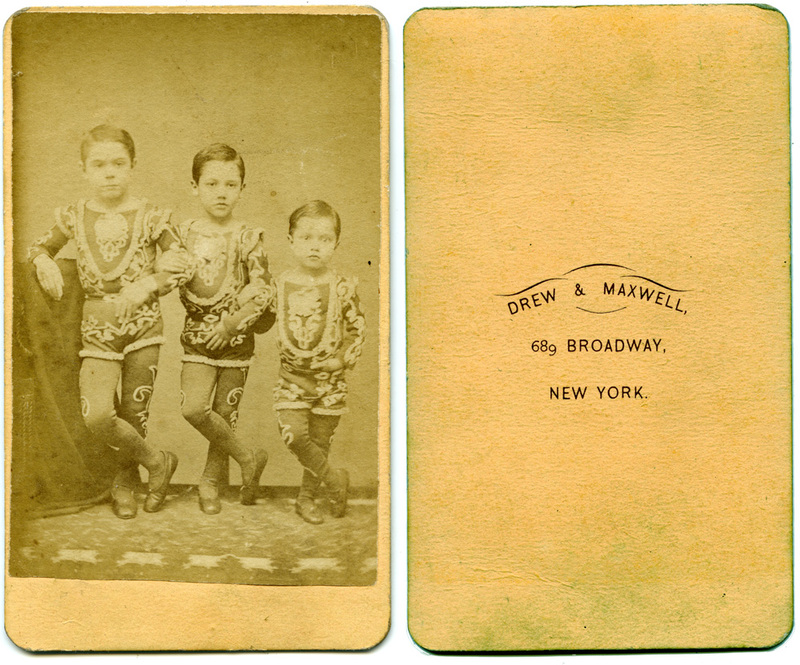 Trio of Boy Acrobats, by Drew & Maxwell - possibly the O'Briens? I’m really interested in the Madame Sherwood image. You say its part of an Anthony publication. Do you have the rest of the publication, with the (likely) Brady image, or just the lone image? Please contact me off blog if you would — I’m a doctoral student in Art History doing research in this area. When it says Published by Anthony, it means that they literally produced the CDV itself for sale. I don’t know if they ever included it in a printed catalog you could order from (which it would be reasonable to assume they did, but I’ve never seen one), but the CDVs were the 19th century equivalent of Topps baseball cards. Thanks, just wanted to confirm that this was indeed a lone CDV, and not part of a larger publication or album that you had. It’s hard to tell from the image posted without context. Is it regular CDV size? The embossing is really interesting. Is the print just adhered to the card backing as usual, then embossed? The card is a standard size CDV. As far as I can tell, that’s how the embossing is done – they adhered the albumen print to the card, then embossed the seals at the corners. If you look at the Tom Thumb wedding photos, they have the same embossed seal in the corners. The seal says EA for E. Anthony.